August 27, 1990, Elkhorn, Wisconsin. Stevie Ray Vaughan, a guitarist, singer, songwriter, and an influential electric blues guitarist died in a helicopter crash. Stevie Ray Vaughan was on a summer music tour called the "In Step" tour. Stevie Ray Vaughan had played two shows on August 25 & 26 at Alpine Valley Music Theatre in East Troy, Wisconsin with Eric Clapton. The shows also featured Buddy Guy, Jeff Healey, Robert Cray and Bonnie Raitt. Near the end of the show, bass player Tommy Shannon and keyboardist Reese Wynans had left the music auditorium and departed on a helicopter back to Chicago. After Eric Clapton's set was finished, over a ear-deafening applause, Clapton introduced "the best guitar players in the entire world." One by one, Buddy Guy, Stevie, Robert Cray, and Jimmie Vaughan all strolled on stage with their Fender Stratocasters for an encore jam to Robert Johnson's "Sweet Home Chicago", a fitting tune as all of the musicians were home-ridden to "Windy City". After 20 minutes, they finished off the tune, the lights went up, and the musicians strolled off stage. Stevie was last off stage, as he gave a wink before he disappeared backstage. Tour manager Skip Rickert had reserved helicopters from Omni Flights to circumvent congested highway traffic. The helicopters chosen were Bell 260B Jet Rangers, which were enough for five people to be seated, including the pilot. Seats were reserved on the third Bell 260B Jet Ranger for Stevie, Jimmie and his wife, Connie. However, it is inferred that a miscommunication between Stevie's and Eric Clapton's management happened, as three members of Clapton's management took three seats. This meant that there would be one seat on the helicopter. Stevie was anxious to get back to Chicago, so, as the helicopters were starting their engines, he asked his brother, Jimmie, if he could take the last seat on the third helicopter. Since he didn't want to be separated from his wife, Jimmie told him that was fine. Jimmie and Connie would just catch the next flight. In the pitch-black night, in very dense fog, the helicopters were clear for lift off at 12:40 a.m. Just past the lift-off zone was a 300-foot hill. Vaughan's helicopter was piloted by Jeffrey Browne, who was unfamiliar with the flight pattern for exiting the area over a high altitude and in dense fog. The helicopter was guided off the landing zone, flying at a high speed about a half-mile from take-off. It then, however, veered off to one side, disappeared into the darkness, and the helicopter crashed into the hill. Everyone on the rest of the helicopters made it to Chicago safely, unaware that one of the helicopters failed to return. The only people who were aware of the crash were officials at the Federal Aviation Administration, who had been notified that a helicopter was down. At 7:00 a.m., sheriff's deputies arrived at the site and located the wreckage. According to observations, the helicopter had slammed into the hill at such a high rate of speed and it happened so quickly that Stevie and the passengers never knew what hit them. Their bodies were thrown across a 200-foot slope. NTSB report indicate: Four helicopters were being used at night to transport a concert group from a golf course area near Elkhorn, WI, to Chicago, IL. As the third helicopter (N16933) was departing, it remained at a lower altitude than the others, and the pilot turned southeasterly toward rising terrain. Subsequently, the helicopter crashed on hilly terrain about 3/5 mi from the takeoff point. 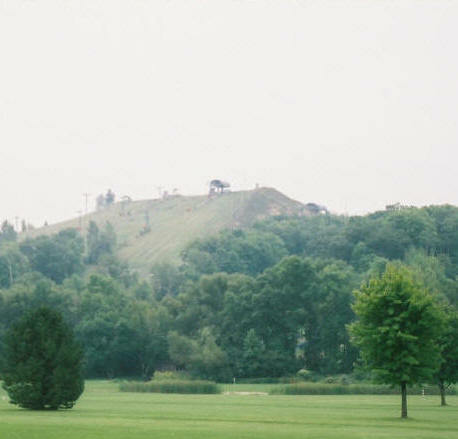 Elevation of the crash site was about 100 Ft above the golf course and 50 ft below the summit of the hill. No pre impact part failure or malfunction was found during the investigation. Pilots of the other helicopters reported VFR flight conditions with some fog. A ground witness near the Crash site reported haze and ground fog of varying intensity with patches of low clouds, but said stars could be seen through the fog. Probable cause: improper planning/decision by the pilot, and his failure to attain adequate altitude before flying over rising terrain at night. Factors related to the accident were: darkness, fog, hazes, rising terrain, and the lack of visual cues that were available to the pilot. Injuries: 5 Fatal.